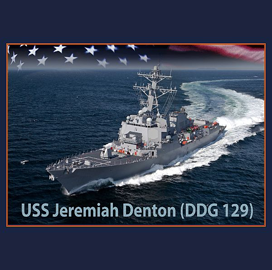 The U.S. Navy has named upcoming Arleigh Burke-class destroyers after former senators Jeremiah Denton and Ted Stevens. The USS Jeremiah Denton takes the name of a Vietnam war veteran who represented Alabama as a U.S. senator, the Navy said Friday. Denton, a Navy Cross recipient, joined the military as a test pilot after graduating from the U.S. Naval Academy in 1947, and went on to develop tactical approaches that the service branch still applies. Meanwhile, the USS Ted Stevens honors a former member of the Army Air Corps who served as senator for Alaska over a tenure of 41 years, the branch said in a separate announcement. Both ships will measure 509 feet in length, and will undergo construction at Huntington Ingalls Industries shipbuilding facility in Pascagoula, Miss. The guided missile destroyers will feature anti-air, surface and anti-submarine warfare equipment that are geared to function simultaneously.